Al soaked Mac in beer last night. He said it was an accident. Not sure what Freud would say. I freaked. At 25 pages from finished with “first love” manuscript and worked all day yesterday producing 40 pages ripped right from my guts. Also, it’s Mac, so I have automatic backup but I don’t really know how or if it works. I had not saved “first love” to my external drive. I had not even saved it to a thumb drive. I know but Mac has special things that save for you and I trusted that. Until last night. I peeled the soaking case off Mac and dried it and tried to figure out, after two martinis, how to save to a thumb drive. I couldn’t. Neither could Al, but then he knows nothing about Mac. I was not going to bring out my external drive and my notes from the last Mac class. Not after those martinis. Al and I were doing so good, but every day it’s like “we’re good/we’re not” over and over. Round and round and round in the circle game. I never should have left him alone with Mac. I never should have left Mac unprotected on the table with a beer! Mac was my first purchase in my attempt to become a more whole person, claim a bit of independence and maturity. Al really liked me the old way, where he took care of thing like computers and I stayed in the kitchen and worked on making tofu something he might eat. Sure I wrote, but he was my go-to tech guy. I did not attempt to handle anything myself. Now I am doing it all. So, you know, I was suspicious. Is Al jealous of Mac? Or maybe he’s in competition with “first love” which takes so much of my time away from perfecting healthy delicious meals and ironing shirt collars. So this is my test. Will my machine still post blogs? Will it tweet? Will it print? Will it let me finish my book before I leave for Seattle? I’m starting here. 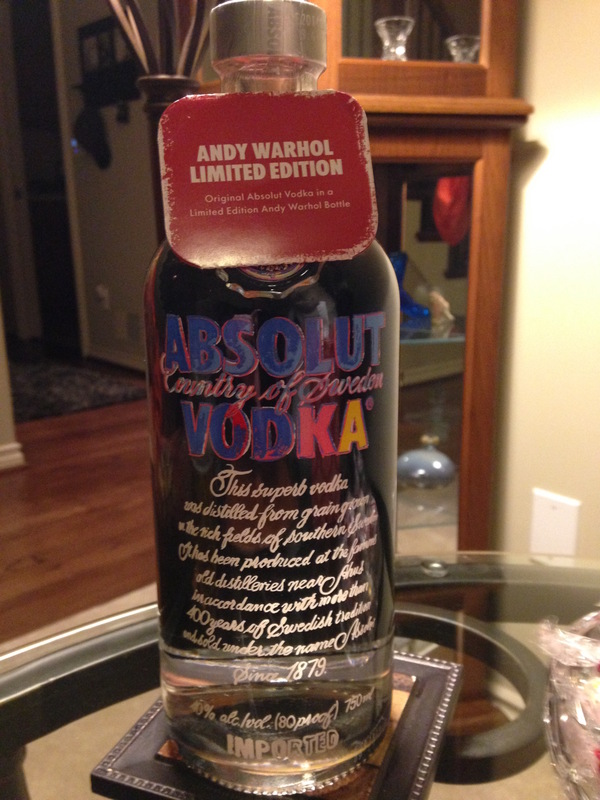 PS that Andy Warhol designed bottle of Absolute made a mean martini. But next time I’m putting Mac safely back in the writing cave BEFORE cocktail time. Something like this happened to me once and I lost everything. I think it takes a disaster to make us save everything, keep it all safe. Me, I have a box full of flash drives, (I think you call them thumb) I save everything, at least once, sometimes twice. Once bitten and all that! Hope you come out a winner in the end! I got lucky everything is safe–but this is my wake up call. The flash drive is so easy on Windows, but I need to figure it out on the Mac, which is shipshape, thanks, Sharon!